John Boileau and Dan Black tell for the first time compelling stories of some of the 30,000 underage youths -- some as young as fourteen -- who joined the Canadian Armed Forces in the Second World War. John Boileau and Dan Black tell the stories of some of the 30,000 underage youths - some as young as fourteen - who joined the Canadian Armed Forces in the Second World War. This is the companion volume to the authors' popular 2013 book Old Enough to Fight about boy soldiers in the First World War. Like their predecessors a generation before, these boys managed to enlist despite their youth. Most went on to face action overseas in what would become the deadliest military conflict in human history. They enlisted for a myriad of personal reasons -- ranging from the appeal of earning regular pay after the unemployment and poverty of the Depression to the desire to avenge the death of a brother or father killed overseas. Canada's boy soldiers, sailors and airmen saw themselves contributing to the war effort in a visible, meaningful way, even when that meant taking on very adult risks and dangers of combat. 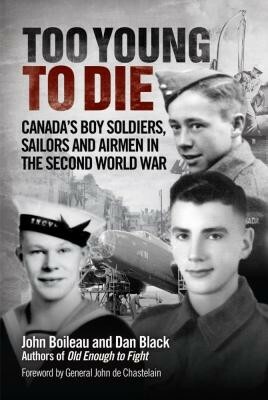 Meticulously researched and extensively illustrated with photographs, personal documents and specially commissioned maps, Too Young to Die provides a touching and fascinating perspective on the Canadian experience in the Second World War. Detailed it may be , but it is also a first class read and will appeal to both the general reader and military historians. 4.5 stars. History is peppered with stories of young men who joined up when they were under age. Boileau's book takes a look at a huge number of young men aged 14+ who joined the Canadian Armed Forces to fight in the second world war.